HTML5 video element allows us to create caption enabled video pages. Captions/subtitles allows media contents to reach to different geographical locations. For example, if the media contents are in English and need to be translated into French or German to reach an audience that speaks these languages. We can provide the subtitles in our HTML5 Video element in the favorite language of the user. To provide subtitles in HTML 5 video element, we will make use of WebVTT and TTML format files. These files are simple text files. Subtitles - The translation of the speech/dialog based on time. Captions - It is similar to subtitles but it can include sound effects or other information of the media. Chapters - You can create chapters so that user can navigate through the video. For example, creating chapters based on a slide show of Power Point Presentation. Metadata - Information about the video which you can access using scripting languages. The WebVTT file [.vtt], starts with WEBVTT. Then it includes the time which is from and to with the decoration/position of the text which you want to display on your media. The position is shown as A:middle, i.e. the center of the screen. The next line is the dialog/speech to display on the media. These contents are known as "cues". Each "cue" starts with an ID which is 1, 2 in our case. It must be separated with a blank line. 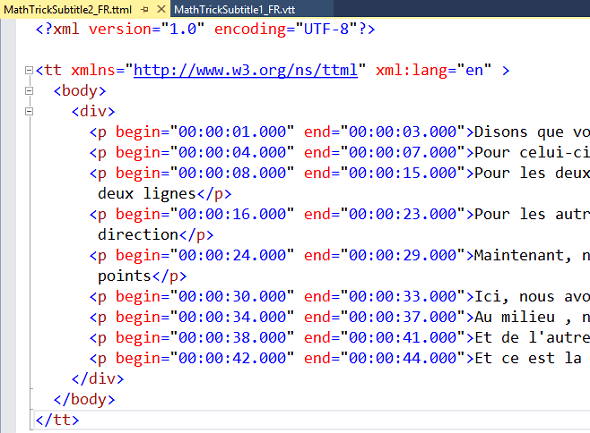 Time specification must be done in HH:MM:SS:MMM format.You can even style the cues using CSS. The above file is used for displaying French subtitles. The root element in this language starts with <tt> with a namespace. Then you include <body> and <div> tags. In the <div> tag, we are including cues. The timing is specified with the begin and end in the paragraph tag. Compared to the VTT, the TTML format looks little complex. But when you start using it, you get familiar with it. Now let's start creating our demo which will display the video in HTML 5 <Video> element and subtitle the same in English and French. 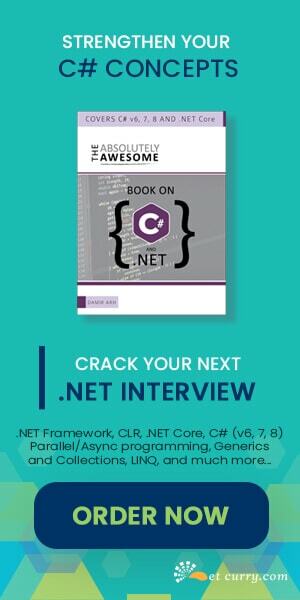 To start with, create a blank ASP.NET Web application and add a HTML page. 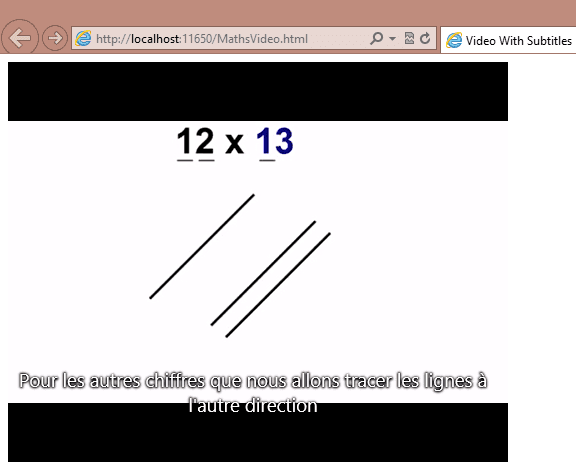 I have named my HTML page as "MathsVideo.html". 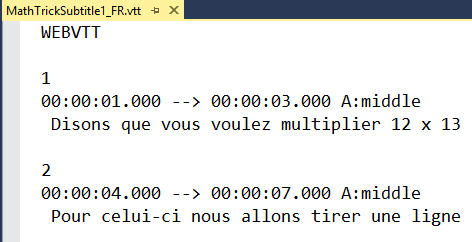 I have used a translator to convert the English speech to French. That could be the reason, you may not see the correct word as per the speech. Now open the Web.config file and write the code shown below. This code registers the MIME type for WebVTT and TTML. If you don't include this, you may not see the subtitles in our video. In the above code we are using <video> element and the <track> element inside the video element. The <track> element contains several attributes like - kind - You can set the value of this attribute like captions, chapters, descriptions, metadata and subtitles. We are using subtitles. srclang is set to en and fr respectively. The label and the path of the source file. We are also making English as a default subtitle. User can change the same as per his/her choice. Now run your web page and see the output. It will be same as shown above. I have done a test of WebVTT which is supported by IE 10, Google Chrome 18, Firefox. TTML is supported by IE 10. 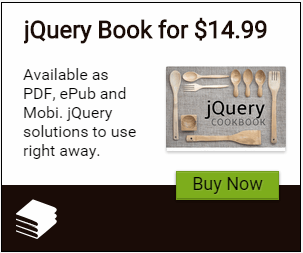 But I didn't find the support for the same in Google Chrome 39.0 and Firefox 33. 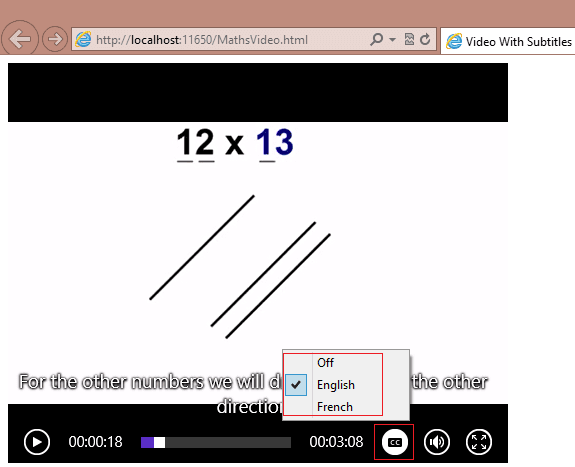 Summary - In this article, we have seen how to display subtitles using HTML 5 video element. We have seen WebVTT and TTML file formats to create the subtitles and embed them using a <track> element.